Conor Stakelum (25) competes at the European Figure Skating Championships this week in Minsk, Belarus (23-27 January). This is the five-time Irish champion’s second consecutive participation at the event following his debut last year in Moscow, Russia where he became the first Irish male figure skater to compete in the 118 year history of the championships. Stakelum will first take part in the short programme which will be held on the afternoon of Thursday, 24 January from 12 noon local time (9am Irish time). He drew to skate 11th of the 36 men competing and will be on the ice at 1:42pm local time (10:32am Irish time). He will perform seven required elements and if his scores place him in the top 24 skaters he will advance to the free skating on Saturday, 26 January. You will be able to follow Stakelum’s progress in Minsk live on the Eurosport Player (subscription service), the competition results page and on social media using the #EuroFigure #FigureSkating hashtags. 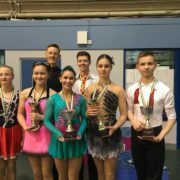 The European Figure Skating Championships are being held in Minsk for the first time ever. Stakelum will be one of 145 skaters from 34 countries who will participate in the event.